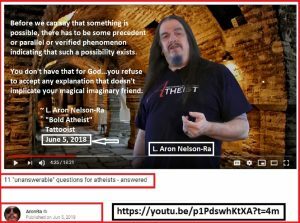 L. Aron Nelson-Ra v. Robert Baty on Atheism – Kent Hovind v. Robert Baty – The Great Debates! 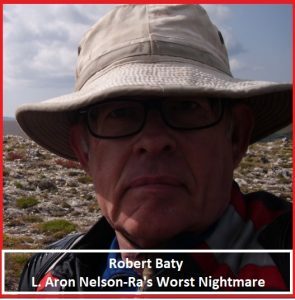 You didn’t answer my earlier inquiry, and another not-so-bold atheist, Brian Westley, is prodding me to make further inquiry of you, so I thought I would pacify him with this inquiry. If you accept the minor premise and conclusion of the following Argument, what is your position on the major premise. That is, do you accept or reject the major premise? THEN (B) man did originate the idea/concept of God through the power of imagination. (A) Man was able to originate the idea/concept of God through the power of imagination. 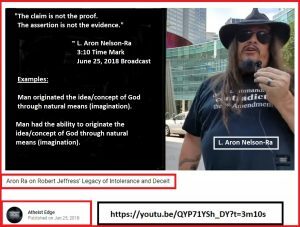 (B) Man did originate the idea/concept of God through the power of imagination. I guess I don’t understand the question. Either that or the answer is too obvious. If you take the conclusion and minor premise you can infer the major premise therefrom and construct the modus ponens form argument I presented for your consideration. So, in affirming the minor premise and conclusion, do you also, explicitly, affirm or deny the major premise? Again, I must not understand the question. Why are you still asking it after I have already answered it? Yes, man certainly can imagine gods in his own image and has evidently done so many times. 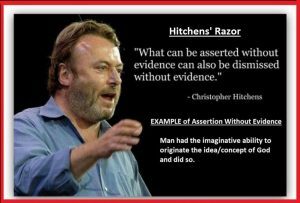 It’s part of my Atheism 101 Critical Thinking Exercise. You have not answered the question. Questions dealing with your acceptance of the conclusion and minor premise are quite distinct from what your position is regarding the major premise. 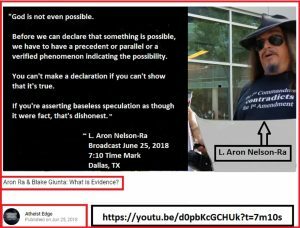 I have proposed that, as previously explained, the major premise is logically, validly inferred from the conclusion and minor premise and completes a modus ponens form argument. I get that you explicitly affirm the conclusion and minor premise, but will you also, as would be implied, explicitly affirm the major premise? I figure you don’t really have a choice, and I get a lot of flack from atheists in so stating that. So, it’s come down to trying to get you to explicitly affirm or deny the major premise. I will repeat my affirmation of your major premise that I gave when I answered your question the first time. That’s fine, Aron, and not altogether unexpected. of God through the power of imagination. 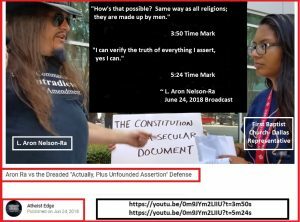 I am not proposing to debate the matter, but rather simply help your people understand your explicit position on this important public matter which is one of the substantive issues my Atheism 101 Critical Thinking Exercise deals with. It’s a pet peeve of mine that I should not repeatedly explain what I have already repeatedly explained when it was already so obvious that no explanation should have been needed in the first place. I have explicitly answered your question three times and you already knew the answer before you asked. So don’t expect another reply. Thanks for that further response. 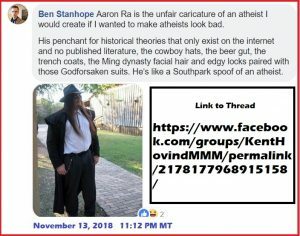 It goes a long way in vindicating my position and my representation of your position as a “Bold Atheist” who is not really so bold. If you answered the major premise question even once, I missed it and you conspicuously evaded simply “affirming” or “denying” it in your last post. I won’t expect another reply. I think I got what was needed, absent an explicit, open, honest “affirmation” or “denial”. Robert what is your position ? And in a simple sentence, not a manifesto of nonsense. 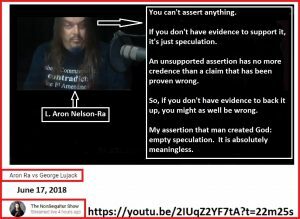 My position is neither of the premises or conclusion are true; I “deny”. My position is the Argument, the foundation of my Atheism 101 Critical Thinking Exercise, which developed out of my debate with Dr. Dziubla, is what the “Bold Atheists” like Aron are stuck with and yet, when presented in such a simple, logically valid format even atheists can see they have nothing but their own imagination to account for the origin of the concept/idea of God. 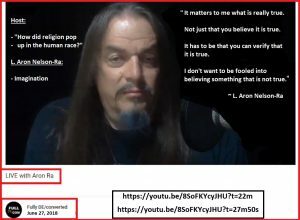 My debate with Dr. Dziubla, similarly, was in response to his challenge to me via the James Randi Educational Foundation Forum (has a new name now) and deals with an issue raised by Alexander Campbell in his 1829 debate with Robert Owen. No, see, I won’t read that. Please follow simple instructions for my benefit. Men made gods up…what is your position? There is no debate unless you would also like to debate the existence or the thought up existence of the Grinch. 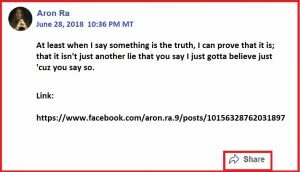 Come out of your false character and answer simply or I’m out and will write you off as another Hovind. See, the thing that is very different with me as opposed to other disbelievers; I make it very simple to understand. 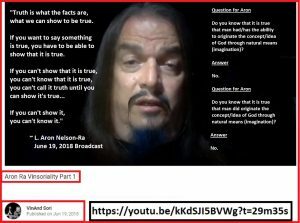 I guess he just can’t handle the truth, but may be the best surrogate Aron has to run a little interference for him. 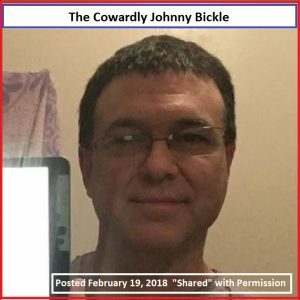 FYI – After showing up, popping off, he, Johnny Bickle, ran off and blocked me. 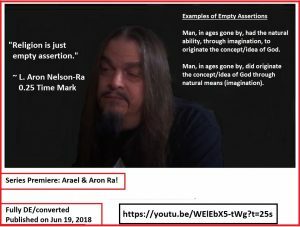 I guess L. Aron Nelson-Ra is implying that he does not propose that it is true that the origin of the idea/concept of God resulted by natural means/imagination; because he certainly cannot prove it.